Canon 70-200/2.8 or 100-400mm IS lens. Nikon 70-200/2.8 or 80-400mm VR lens. Easy to use with a shorter lenses up to 11" (28 cm) long. Takes seconds to attach or remove. For handheld or tripod shooting. Works with lenses that rotate to focus. Made of Silnylon - a waterproof, ultralight, & tough high performance fabric. Flash works thru the cover. Maximum flash range - keep the cover against the flash. Flash Diffusion - billow the cover away from the flash. You can see the print on dials & buttons when the cover is held against the camera (it's opaque when it's not touching the camera - see photos). Makes a handy sunshade. DSLRs produce images with less "noise" if you keep the camera's sensor cool. BLACK covers help in viewing the LCD screen in sunlight. You can use this cover in WHITE with lenses up to 7" (18 cm) long. The cover has an elastic cord & cordlock on both ends. 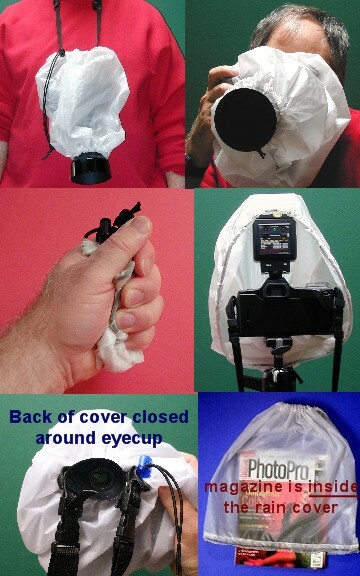 You slip the camera into the back end of the cover and attach the small end of the cover around the lens. Leave the back end open however much you want when you're shooting (the back opens to about a 10" diameter circle when fully open). If you use a viewfinder extender or eyecup, you can close the back of the cover around them.